To evaluate trends in frequency and indications for obtainment of prostate multiparametric MRI over the past six years (2012-2017). Through a database search spanning January 1, 2012 to December 31, 2017, 277 patients with prostatectomies performed at a single institution were identified. Of these, 39 had a prostate MRI prior to the procedure. Indications for prostate MRI were categorized into 3 groups: detection (no prior established diagnosis of prostate cancer), staging (exclusion of extracapsular or seminal vesicle invasion) and active surveillance. An upward trend in prostate MRI use prior to prostatectomy was noted over the last 6 years. 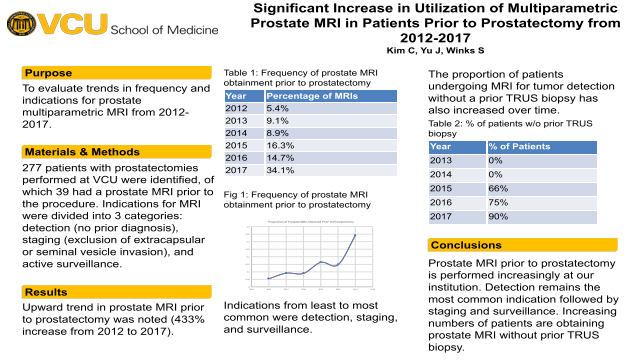 The increase in use of prostate MRI in 2017 compared to 2012 was 433%. Prostate MRI obtained prior to prostatectomy was 2 of 37 prostatectomies in 2012 (5%), 6 of 66 in 2013 (9%), 5 out of 56 in 2014 (9%), 7 of 43 in 2015 (16%), 5 of 34 in 2016 (15%), and 14 of 41 in 2017 (34%). Indications from most to least common were detection, staging, and active surveillance. Detection has remained the most common indication, while active surveillance has gradually become more common over time. Additionally, the percentage of patients undergoing prostate MRI for tumor detection without prior TRUS biopsy has increased over time: 0% in 2013 and 2014, 66% in 2015, 75% in 2016, and 90% in 2017. Ask the author a question about this poster.